HALLIE EPHRON: I have a theory that certain possessions tell you a huge amount about the person who owns them. Underwear, just for example (black lace or Lollipop). Sleepwear, too (negligee, granny gown, or old shorts and a T). Also the coffee mug you pick to fill when all of them are clean. But today we're not going to talk about underwear or sleepwear or coffee mugs. I want to talk about salt (and pepper) shakers. Because as much as anything I think they define some of us. Here are two sets of salt and pepper shakers that belong to my older daughters (pigs and muscle men). No fine china for her -- these say it all. Her quirky sense of humor, love of the absurd. She does not take herself too seriously. My younger daughter (the architect) has an Empire State Building salt shaker. Here are mine, a pair of Depression glass salt and pepper shakers that I picked up years ago at...where else? A yard sale. Plus a pair of frogs from Portland, Maine, and a pepper grinder that belonged to my mother. So what do your salt and pepper shakers tell us about you? Silver and crystal from Mom's estate. Wood from I bet--college. Can that be? At least from an earlier marriage, Jonathan's or mine, who knows. Plastic from, who knows. And I looked and looked but I cannot find the matching salt.It's somewhere. I guess we don't use it! The tulips are for extra credit. LUCY BURDETTE: You've stumbled on one of my quirky addictions Hallie. Except for baking, I use Jane's Krazy Mixed-Up Salt on everything. The label says it contains sea salt, pepper, dehydrated onion and garlic, herbs and spices. I love it so much that I buy extras in every grocery store for fear it will disappear like Hank's favorite lipstick. So that's what's on our table, along with a wooden pepper mill. DEBORAH CROMBIE: These in the photo are not mine. They were on the table in Strada, one of my favorite Italian chain restaurants in London. Mine are acrylic like this, but they don't match. One got broken somewhere along the way and was replaced. I won't bother with pepper unless it's fresh ground, and am addicted to fresh ground sea salt. It tastes different! Really!!! The flavor just pops in your mouth, and you only need a little salt to jazz food up beautifully. So I guess that puts me in the cook camp? SUSAN ELIA MACNEAL: I'm with Debs in the cook camp — we have a pepper mill and a sea salt mill in the kitchen that we use while preparing food. I think well enough of my cooking to assume it doesn't need additional seasoning! HALLIE: Susan, I took a guess at what your giraffes were like... close? So what about the rest of you? Fancy salt and pepper shakers or fanciful? Gourmet or everyday?? Hallie, this is fun. 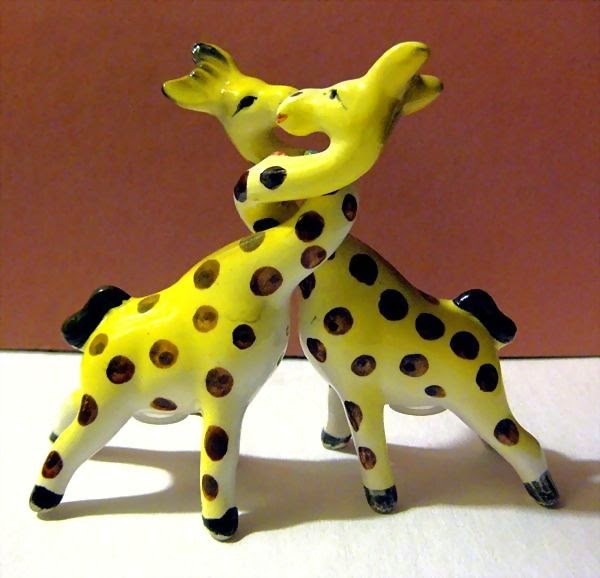 I love Susan's giraffes! We have a pewter salt shaker and pepper grinder set that my mother-in-law inherited. It has its own pewter mini tray. At the stove we have an adorable pair of Delfty looking Danish windmills that a granddaughter brought when she came to visit from Denmark. Everday we use a disposable glass pepper grinder, because it keeps the pepper fresh in the sealed jar. 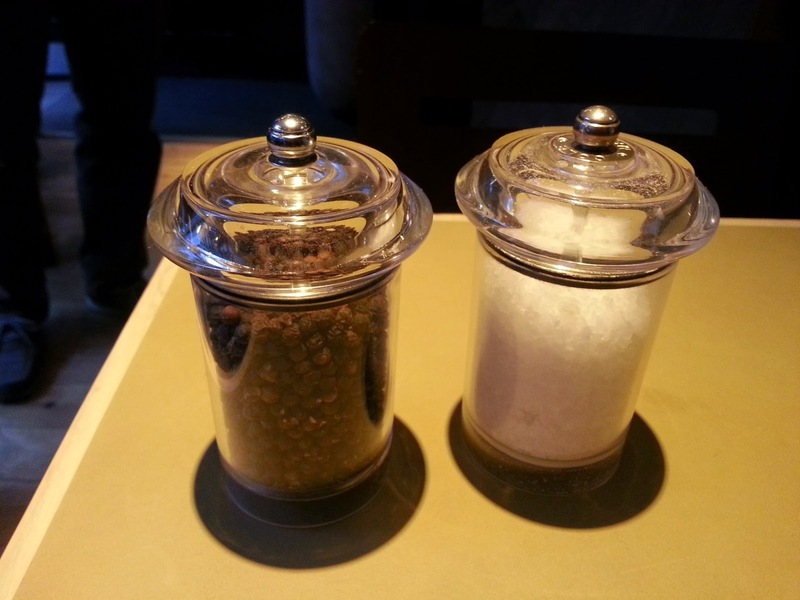 And I keep salt in an old glass spice jar that sort of matches the pepper grinder. I like it, because it has a flip top lid. I am always knocking the salt over, And the lid contains it. Did someone say don't reach across the table? Auntie-Mom? Hah! Like Debs, we always have freshly ground pepper and salt. On the table I have a glass set of grinders filled with black peppercorns and sea salt . . . in the kitchen, I cook with Himalayan pink salt and either white, black, pink, green, or mixed peppercorns, depending on what I'm cooking . . . .
Himalayan pink salt! We were in Peru last year and saw where they min the stuff in the Andes. It tasted... like salt. Do you think you can taste a difference? Oh, Reine ... you reminded me, Another Rorschach is: What do you do when you spill the salt? Superstitions, anyone? Wonderful. My favourites from my childhood (which I still have) are an S and P shaped shakers. Of course, when I was a kid, I liked to think they were actually the initials of my brother and me. Susan and Pat. I just love quirky, fun salt and peppers! But, because that's another thing that could so easily become a collection, I have purposely stayed away. But I'm tempted every where I go. So we have an acrylic sea salt grinder and a crazy battery operated pepper mill that no one knows how to use. Well, Donald and I do, but when we have company it always requires a quick little instruction. Button on top, little "trap" door at the bottom. Push button, whrr whrrr, pepper should fall - right? Of course. But there's this little trap door there that won't allow it. Open that and LordAMercy - TOO MUCH pepper trapped there by all the button pushing and whrr whrrring! Weird, very weird. But. My mother gave it to Donald because he is such a lover of pepper. And so, it stays. Hallie... Is that the salt over the left shoulder thing? No no... but what is that salt over the left shoulder thing? Did I mention the things on the windmill salt and pepper shakers go round and round? But slowly, because they are china. Oooh, I want pink pepper corns! And green peppercorns! A new foodie thing to try! Reine, I've used the the throwaway pepper grinders, but like mine better and couldn't tell that much difference. Until we moved full time to Cape Cod, I used to use a couple of fun salt and pepper shakers -- even here I had Fiestaware ones that match the dishes -- but the humidity simply won't allow the use of normal shakers. My husband and I have different solutions (of course) -- I use the salt and pepper shakers from the store, and keep the cover on the salt at all times. He has found that the cardboard ones that you use for picnics must have some chemical in them that prevents the salt from forming bonds or whatever. When a good friend died three years ago, I asked for one of her s & p sets -- she collected them -- but I don't think her daughters have opened the china closet yet. Or they forgot. Oh, man, do I have salt shakers. When my brother took over the cottages and said he was going to throw everything out, I took all the salt shakers, so I have them everywhere-- but only one pepper grinder, the smaller wooden one I could afford back in the Seventies when I really wanted one (I fill it constantly). My prized possession is a set of Depression era green (different from the reissue green) ball-shaped Fiesta salt and pepper shakers and a round green Fiesta sugar bowl that sit in a longish dish that might have been designed to hold them or might be a pickle dish. These were my grandmother's, and when I was really small, I would see them on her table, or be able to look UP at them on the pantry counter. They were in her cottage when I left for law school, and she gave them to me then (along with some Depression era tan plates that my sister now has; we recycle a lot). I keep salt in both shakers, as my grandmother did, because the only pepper I use is freshly ground. I had a pair of my grandmother's Desert Rose rose-shaped salt and pepper shakers that I didn't need and was afraid would get broken. I gave them to a client who collected salt shakers, and later failed to pay her bill. So much for good deeds. I keep a small jar of kosher salt (with a small plastic spoon inside) on the ledge above the stove, and mostly use that for cooking. When I make rice, I don't salt it, but throw a piece of dried kelp into the pot, a Japanese cooking trick I picked up years ago. When I moved into my house, my mom gave me a tiny square, silver-topped individual salt shaker for luck. I use that most of the time to salt what I'm eating if I think it needs it. My mom collected salt and pepper shakers and displayed them on shelves on the wall. I think my sister has them boxed up somewhere now. Same sister - the comedian - gives the funny gifts. My husband likes The Walking Dead so we have a pair of bloodshot eyeballs and my nieces call me Aunt Pepe so I have a set of Pepe le Pew & his girlfriend Penelope shakers that have signs "I am Salt" and I am Pepe." Loving all these S&Ps... yes left shoulder, Reine. I know that round Fiestaware shaker.... in orginal green. Fun topic! I feel like I've been asleep on this one, though. Another opportunity to reveal my quirkiness and I haven't taken advantage of it. For quite some years, I used the salt shaker from my parents' house after they died. It was a nice, sentimental reminder. Then, I decided I wanted to put it up on the shelf above the kitchen sink to keep it safe. I now have just generic salt and pepper shakers. I need to check into some of the fancier, more complex daily seasonings mentioned here. Also, I now have yet something else to look for when I go to Key West in September. My favorite coffee mug is from there, Hog's Breath Saloon, so I need to find some matching S & P shakers or something equally as fun. Any ideas, Roberta? Oh, I meant to comment on the superstition of salt over the shoulder. Yes, I religiously observe this ritual. My kids take great delight in tormenting me with spilled salt, even though they are 27 and 30 and you'd think they wouldn't be so childish (hehehe). At least I try to chide them for tormenting me. Apparently, though, I am a great source of amusement in this area. Susan, I also meant to wish you a speedy recovery from your pneumonia. I would NEVER NOT thrown spilled salt over my left should.I simply would not think about NOT doing it. SO ridiculous. but hey. And why if the salt shaker is knocked over, but none spills out? I pretend. Just in case. ELlen, those are some terrific salt stories!Who knew? NObody throws pepper, though, correct? wonder why..
Lucy, I completely have a stash of Crazy Salt! I love it. On bagels, with cucumber and cream cheese and tomatoes. It is YUMMY on everything, I agree! I love crazy salt, too! I like to make popcorn the old-fashioned way and sprinkle crazy salt on it. I fix some for the guys when they're having one of their playoff parties. Sounds very old-fashioned! But Auntie-Mom, who is always right, told me reign in my feminist pride and to think of it as a way to keep the beer and mess corralled. Lucy, we have been looking for Jane's crazy salt for years. Can't find it in upstate NY. Where do you find it? Judy in Oswego, if you can't find it anywhere else can buy it online direct from janeskrazyDOTcom.